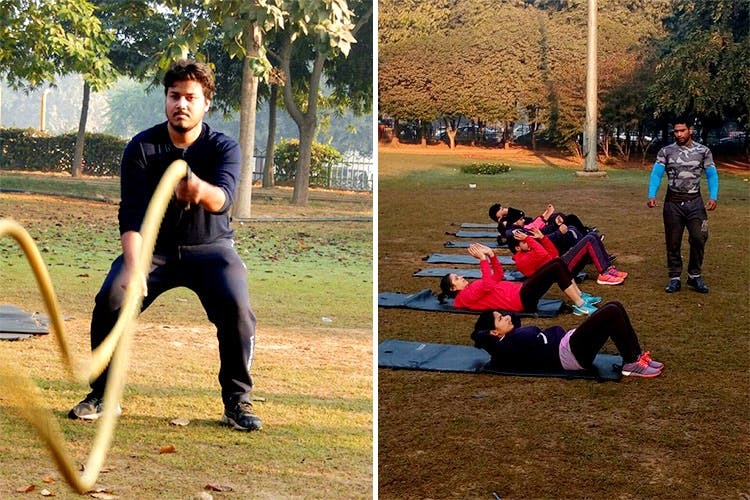 Whether you’re a newbie lifter or a seasoned dumb-bell brawler, enrol with Play Fitness Gyms to test your strength through their unique outdoor military boot camps or their lippy full body bhangra workout sessions. Ever wondered how Stallone did the thumb balance push-ups in the Rocky series? The trainers at Play Fitness go full circle in their customised regimes for you and you may even be able to conquer that. With a regular spread of weights and machines, along with cardio conditioning, this unique fitness centre goes a step beyond to channelise your strengths with their in-house cross fit studio and military boot camps. They make you ‘Hulk Smash’ things, swing heavy hammers around, suspend you on a monkey bar, tire you out on an anchor rope and even high intensity stair climbs – none of which we saw coming in our trial class. They have classes in aerobics, yoga, spinning, Zumba, stretching and abdominal exercises. Play Fitness also offers high intensity dance classes and power lifting and will provide scientific exercise plans which are customised as per your fitness needs. They regularly update their Facebook page with new modules on offer from time to time – make sure you keep checking if you’re looking to try something new. You can head to Play Fitness for the group classes or regular strength training, but if you’re working towards a fitness goal or want to take your workouts to the next level, we think this is a pretty solid bet.